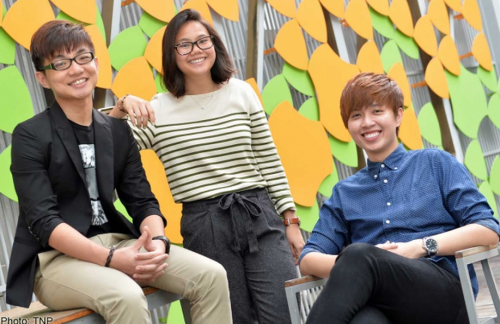 These graduating Singapore Polytechnic students are Gold Medallists, an award given by their poly for academic excellence. As a secondary school student, Mr Yong Ming Jie was a regular at the principal's office and he would usually end up in the detention room after that. He often got into trouble for handing in sloppy work in class and dressing in a scruffy manner. Said Mr Yong, now 20: "I felt embarrassed to be called out in the middle of a lesson. "It was shameful to serve detention too because the detention area was out in the open so everyone could see me." Knowing his teachers did not think highly of him, Mr Yong was not motivated to work hard. He did well enough in his O-level examination to pursue a Diploma in Interior Design at Singapore Polytechnic (SP). But his attitude towards his studies changed after he met his SP lecturers, who encouraged him and believed in him. "They didn't neglect me because I wasn't an outstanding student. They gave me a lot of attention and help every time I troubled them with my questions," Mr Yong said. Touched that his teachers were willing to invest their time and effort in him, Mr Yong gave his best in every project. It was not easy as he had no background in design and had to learn everything from scratch. "Many times, I was tempted to give up. But I had come this far and I didn't want to go back to where I was in secondary school," Mr Yong said. His efforts paid off. Mr Yong, who will be graduating from SP next week, achieved an impressive GPA of 3.88, an achievement he attributes to his SP lecturers. He hopes to pursue a course in architecture at the National University of Singapore. "I (want) to help design and shape my home city, to be an architect who can help influence the cityscape of Singapore," he said. Many students find the first few months in polytechnic fun and exciting, but Miss Khoo Hui Ting's first taste of poly life made her miserable. The 21-year-old, who will be graduating next week with a Diploma in Experience and Product Design, said she was initially disappointed that she had not landed a spot in her desired course. She scored an L1R4 of 15 at the O-level examinations, which did not qualify her for a place in the visual communication and media design course. Miss Khoo (left) felt overwhelmed trying to cope with the projects for the course she was studying and would go home in tears every day. Worried, her parents encouraged her to apply for a change in course or school. But Miss Khoo did not want to throw in the towel and she persevered, telling herself to take things slow and to give herself less stress. "In design, giving yourself stress is counter-productive and it actually stifles creativity. I realised I think better when I am more relaxed. "It helps to try to find joy in what you are doing, too," Miss Khoo said. With the help of supportive friends, Miss Khoo managed to attain a GPA of 3.89. She has been offered a place to study industrial design at the National University of Singapore, but she revealed she was initially afraid to take it up. "I considered working first, but I've decided to give myself a chance and I should not back down without giving university life a try." At 28, Mr Jenson Seah is one of the oldest graduates in his cohort. And his journey to success is also more remarkable than most. Next week, Mr Seah, who is getting a Diploma in Integrated Events and Project Management, will graduate with a perfect GPA of 4.0. But his present success belies a past fraught with challenges. As a teenager, Mr Seah was obese and used to be bullied because of his size. "I had no friends in school," he said. Loneliness prompted him to join a gang when he was in Secondary 2. He played truant and was rebellious. "(Academically), I was the last in class and my teachers all thought I was a hopeless case. "They even asked me to leave school because they didn't want me to influence the other students," Mr Seah said. Just months before taking his O-level exams, he dropped out of school. His parents tried convincing him to continue his education, but without success. At her most desperate, his mother even broke down in front of him. "I was shocked to see my mother crying. She later fell into depression," Mr Seah said. Still, that did not spur him to change for the better. Instead, it was a remark his younger brother made that jolted him to his senses. "My brother, who is five years younger than me, said, 'Even I, someone who is not as bright as you, am trying hard to survive and do well. So why are you not trying at all?'" Mr Seah said. So Mr Seah started looking for a job. But with only a PSLE certificate, he could not get the better-paying jobs he wanted and ended up taking odd jobs, such as delivering newspapers in the wee hours of the morning and going door-to-door selling ice cream. Saving the money he earned, he bought 10-year series assessment books and practised them diligently so he could take the N-level examinations as a private candidate. He passed in 2005 and took the O levels a year later. He got a place in ITE College West, where he studied electronics engineering. His lecturer, Mr Low Hock Siew, saw potential in him and would often stay back to coach him. Mr Low also urged him to consider what he wanted to do in life, which prompted Mr Seah to study events management and hospitality at SP. "I like to help run events in the hospitality industry because I get to serve and meet people from different walks of life." Both the National University of Singapore and the Singapore Institute of Technology have offered him a spot to study a business-related course and he is still deciding between the two. "One may not be the best in life, but one should still try to explore and realise one's full potential," Mr Seah said.